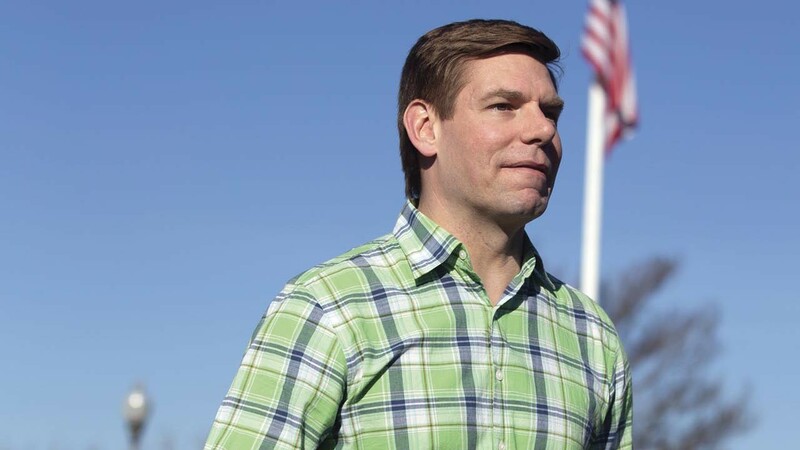 The Mueller report has not slowed down Rep. Eric Swalwell. Rep. Eric Swalwell, a vocal critic of the president and potential candidate for the office himself, returned to the airwaves Monday night, vowing on CNN to double down and continue investigating Donald Trump despite his exoneration from collusion accusations in a memo from Attorney General William Barr. Fox News, rabid rightwingers on social media, and the Trump re-election campaign skewered Swalwell over the weekend for his two years of almost incessant calls of criminal misconduct against Trump that now may have come up empty following news of the Mueller report. Yet the East Bay congressman still maintains he has seen evidence of a conspiracy including Trump and Russia. In addition, as some Fox News commentators called for the resignation of Swalwell, Rep. Adam Schiff, and other Democratic critics of Trump, the president's re-election campaign sent a memo Monday to cable news outlets alleging some, including Swalwell, a constant guest on several programs, proffered false information on their networks. In response, Swalwell tweeted, "The only person who has been caught lying about Russia is Donald Trump. If he thinks I've made a false statement, he can sue me. And I'll beat him in court." An appearance by Swalwell on CNN last Mar. 16 is referenced by the Trump campaign as containing "outlandish, false claims." In the interview, Swalwell said the House Intelligence Committee, which he is a member, found evidence of collusion. Swalwell told CNN's Wolf Blitzer, according to Newsweek, "In our investigation, we saw strong evidence of collusion," Swalwell said. "The Republicans now are choosing to bury it. I don't know what you call it when the Russians make multiple approaches to members of the Trump family, the Trump Organization, the Trump campaign to offer and preview dirt on Hillary Clinton, where the candidate stands in front of a public crowd and says, Russia, you'll be rewarded if you hack her deleted e-mails." On Twitter, conservatives and supporters of Trump have targeted Swalwell for vicious attacks, biting sarcasm, and calls for him to resign after being one of the most visible faces of almost daily assertions on MSNBC, CNN, and even Fox News, that the president colluded with Russia, committed obstruction of justice, and other reported instances of various misconduct. Swalwell's strategy comes at a potentially crucial time for his potentially fledgling presidential campaign. Last Friday, appearing on HBO's Real Time with Bill Maher, Swalwell reiterated that an announcement about his possible candidacy is coming soon. Since taking office, Hayward Councilmember Aisha Wahab has suggested legislation related to rent control, police de-escalation training, raising the city's minimum wage, equal pay for equal work, a recyclable dining and utensil ordinance. All are weighty issues, but oddly low-hanging fruit in a city that has dragged its feet on consequential matters over the past decade, preferring to allow city staff to control the agenda. Wahab's exuberance for quickly solving all of Hayward's problems, however, has created friction with Hayward City Manager Kelly McAdoo and some council members. A proposed change to the City Council's Handbook, the guide used by its members and city staff to run the business of governing, would have stripped each councilmember of its power to control the conversation at Hayward City Hall by limiting the number of legislative referrals requested per elected official to five each year. Wahab has already offered at least five referrals this year, and would have been prevented from submitting any more. McAdoo's proposal also asked that councilmembers consult with her or her office to ensure that their requests are within the city's budgeted resources and describe their referrals in writing two weeks prior to being posted on a city agenda. Over the past few months, McAdoo had indicated that the amount of work created by the referrals is overtaxing an already overworked city staff. Some Hayward elected officials have often reiterated the claim. When Wahab raised the minimum wage question last January, many East Bay cities had already accelerated the rate to $15 an hour. But McAdoo pushed back on her staff's capacity to grapple with the issue, and Hayward Mayor Barbara Halliday agreed. But it was Wahab's questions and referral about police de-escalation and mental health training that was the impetus for the proposal to reform the referral process. The answers to Wahab's question about the types of training and whether Hayward Police receive them did not come easy. In the past, Hayward had no discernible policy nor culture of individual councilmembers proposing their own legislation. For years, the Hayward City Council has been accused of failing from groupthink, which was characterized by the council's seemingly constant 7-0 unanimous votes. Other nearby cities typically allow councilmembers to raise an issue at the conclusion of meetings. If a majority of the council deserves further study, it is usually directed to city staff or placed before a lower committee. "This entire referral policy that we have is not part of the charter." Wahab said last month. "It's something that I think needs more transparency and accountability." In the end, councilmembers decided against the proposal, but not before the entire discussion got really personal. In the run up to the San Leandro City Council's decision Monday night to renew a 14-year-old contract for red-light camera services, a few elected officials were alerted to the website HighwayRobbery.net. The no-frills site created by an activist who opposes red-light cameras, is a treasure-trove of data covering the entire state, in addition, to helpful tips for navigating the process of challenging traffic tickets. The deal offered this week by RedFlex, the red-light camera vendor used by the city since 2005, isn't so good, they found, according to the site. At least, in comparison to other California municipalities. The notion that San Leandro taxpayers might be fleeced by the company, clearly weighed on the mind of some councilmembers Monday night. Although the City Council directed staff to trigger a two-year option to extend the contract with RedFlex, the relationship with the vendor appears in doubt. San Leandro's contract is basically the same that it agreed to in 2011: Six red-light cameras at five locations costing $5,200 each month. San Leandro Police Chief Jeff Tudor told the council that his department had not sought out new technology or other vendors. "We're talking about 14-year-old technology," Councilmember Benny Lee said, noting that technological innovations have likely occurred since the RedFlex cameras were installed eight years ago. "I think we've had this contract way too long." During the same period, both Oakland and Hayward discontinued their contracts with RedFlex. Red-light cameras in San Leandro produced almost 10,000 tickets last year, generating roughly $5 million in fees. However, the city receives just 9 percent of the revenue. Nevertheless, San Leandro reaps $188,000 in extra revenue each year.